My introduction to Pass Labs dates back to some time in the early 1990’s. Back then, there was plenty of “buzz” in the audiophile circle regarding this small solid-state amplifier that actually sounded like tubes. I eventually got to hear the diminutive monoblock amplifier running a pair of Chartwell LS3/5a’s. The all class A operation Pass Aleph 0 left that indelible impression of how far solid-state amplification had come with respect to overall musicality. Later, Pass Labs signed a local Florida dealer, and once again I felt nothing but admiration and respect for the stereo versions and future iterations of the class A amplifiers Nelson Pass was designing. They simply sounded “right” to me. That said, unfortunately I always had to admire them from afar. While the Aleph line of amplifiers were among the best sounding solid-state amplifiers I had heard, they topped out at about 150 watts per channel. They simply didn’t produce the kind of power that I needed for my electrostatic speakers. You see, I am a ‘stat man, and I have had nothing but electrostatics since the early 1990’s. Of course, this all changed just before the millennium. The entire world took notice of this massive beast of an amplifier that was introduced called the Pass Labs X1000. An amplifier that was rated at 1000 watts per channel into 8 ohms and nearly 2000 watts into 4 ohms. I never did actually hear one, but all I heard from friends in the industry was that it delivered the sonic goods in true Pass Labs fashion, and that it took 6 beefy guys to lift it! Just as impressive was the introduction of what would become Pass Lab’s signature casework: A big, bold sculpted statement faceplate in machined aluminum that cleverly doubles as a pair of handles for lifting the heavy beast. Since its introduction, Pass Labs has expanded the line of “X”- designated amplifiers with the X150, X250, X350, and X600; each with a power rating mirroring their model designation. Since then, that model line-up has given way to the more refined “.5” versions of each. The sudden upsurge in power delivery of the Pass amplifiers in the form of the X Series is due to the development and realization of the circuit design dubbed Supersymmetry topology that was patented by Nelson in 1994. This topology has two gain stages: A single-ended Class A input gain stage whose output drives a bank of high power MOSFET devices operated as voltage followers with zero feedback. Distortion and noise are addressed though cancellation by running well-matched MOSFET devices in balanced mode. Distortion and noise identical to both halves of a balanced circuit are claimed to disappear at the output through cancellation, and in a supposedly well-matched symmetric circuit, most of the distortion and noise is identical. The patented Supersymmetry circuit design enhances the effect supposedly by delivering an additional 90% noise reduction effect at the output of the balanced circuit. The class A input gain stage is supposed to impart the sonic character of the amplifier. Therefore in theory, these huge beefy power amplifiers should display the same sweetness, liquidity, and sound staging that has been the heart of the Nelson Pass pure class A amplifiers sonic signature for years. The Pass Labs X350.5 arrived in late March. Of course I knew that the amplifier was quite large and heavy, and I was even fore-warned that it had to be shipped to me via common carrier; but even with that knowledge it was quite impressive to see this huge box arrive at the base of my driveway, strapped to a heavy shipping pallet. 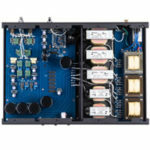 The Pass Labs X350.5 amplifier is the largest and most powerful stereo amplifier in the X Series line of amplifiers. It is rated at 350 watts per channel into 8 ohms, and roughly doubles that into 4 ohms. Despite its prodigious size and mass, it was a rather easy and straight-forward task (for two guys) to lift the amplifier out of the shipping box and place it on my tubular steel Billy Bags amplifier stand. Hook-up of this amplifier is also a breeze. The speaker binding posts are large flanged units that can be hand-tightened. Signal hook-up is accomplished via a set of single-ended RCA connections or balanced XLR. For this review, all interconnects utilized were single-ended RCA. A circuit breaker switch on the rear of the amplifier facilitates getting power to the amplifier’s circuitry in standby mode. A front panel button facilitates activation from standby mode. Once powered up, the Pass Labs X350.5 warms up in about an hour. 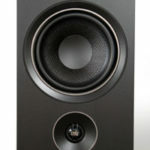 I used the superb Aural Symphonics Magic Gem v2t powercord over the full term of the review period, and I configured the rest of the system using Aural Symphonics cables throughout. I have been reviewing the MagicGem v2t power cords, Chrono interconnects, and Purple v3 speaker cables for the past few months and I decided that the performance they bring to the table would be very well-suited for the Pass X350.5. During the course of the review period, I occasionally swapped speaker cables; specifically between the copper-based Purple v3 and silver-ribbon Pure Note Paragon-Enhanced, (more on that in a future review). 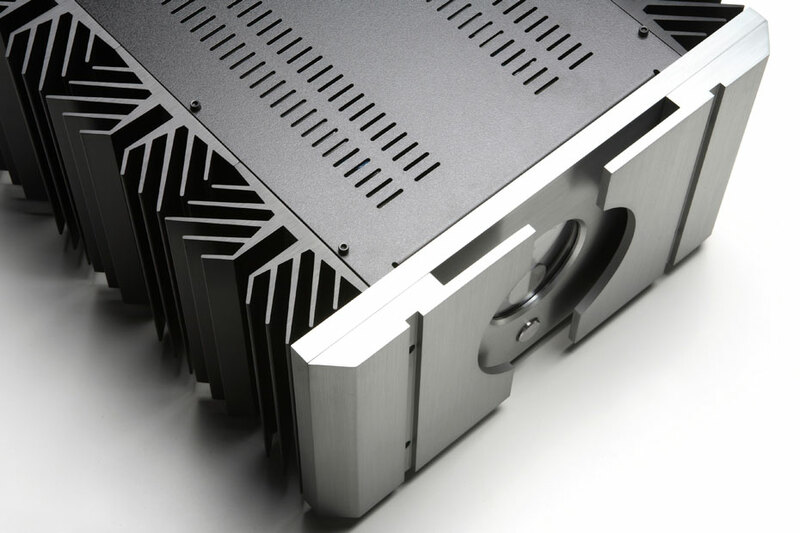 The Pass Labs X350.5 amplifier required a fairly short break-in period to sound its optimal. I ran it in for 7 days, 24 x 7 with my break-in CD for starters. I’m sure that’ll be quite an impact to my home electric bill, between the 1800 watts (maximum draw) of the amplifier and the strain on my central air conditioning unit in order to keep the ambient temperatures in my sound room in check. I guess this would be as good a time as any to point out that the X350.5 dissipates plenty of heat. It is specified to run nominally with the heat sink temperature around 50 degrees centigrade, that’s roughly 120 degrees Fahrenheit. Since my Martin Logan CLS2z’s run nominally at 4 ohms and at 1.5 ohms in the high frequencies, and since I was running them plenty loud, I suspect that the amplifier was dissipating more than the usual 120 degrees. Florida Power and Light will indeed be sending me a one heck of a usage bill! The good news is that the amplifier remained rock stable and ran my full-range electrostatics at relatively high levels straight out of the box without any drama whatsoever. Sonically, break-in was fairly uneventful. Straight out of the box the amplifier already exhibited sonic characteristics more akin to a tube amplifier than solid-state. A certain midrange liquidity was clearly evident and it showcased itself quite well through the electrostatics. After break-in, image depth and width improved and image specificity came into acute focus. There is generally nothing dramatic to report with respect to break-in. The amp is quite good out of the box and simply improves over time. I sat for my first extended listen on a Sunday afternoon as is customary. I was quite confident that the amplifier had been sufficiently burned in. It is important to note that warm up of the amplifier for optimum performance was a relatively short 1-2 hours. By contrast, my long-standing reference amplifier really needs an overnight warm-up to come into its own which is likely why it has no power switch. 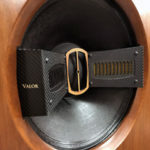 As I played the usual range of female and male vocals from my CD arsenal, I was impressed with the sheer liquidity and lifelike presentation the Pass Labs amplifier exhibited. For instance, on Katie Melua’s, ‘What it Says on the Tin”, from the CD entitled Pictures, the X350.5 presented Katie’s voice with such delicacy and “juiciness”, that you would swear that you were hearing triode monoblocks instead of the huge imposing solid-state beast that had taken the center stage of my sound system. Throughout this particular CD it was noteworthy that the soundstage presented in my system was as wide as any I have heard. The midrange performance on acoustic guitar and vocals was astonishingly lifelike and exuded that glowing presence that you normally experience with vacuum tubes. After listening to a variety of female vocal works from Katie Melua, Dawn Upshaw, Patti Smith, and Rickie Lee Jones, I switched to male vocals such as Neil Young, Kevin Gilbert, and Peter Gabriel. Noteworthy was the way the Pass X350.5 captured the intended darkness, immediacy and emotion of Peter Gabriel’s performance of Paul Simon’s “Boy in the Bubble”, the compelling interpretation of Lou Reed’s “Power of your Heart”, and Neil Young’s “Philadelphia”, and the driving force of Arcade Fire’s “My Body is a Cage”, from Peter’s decidedly dark and personal new LP, Scratch My Back. Several fundamental traits consistently emerged from the X350.5. Firstly, this is one very accurate and dead-on neutrally-voiced amplifier. It handily and consistently laid bare the fact that my reference amplifier is “voiced” with a midrange “Gundry dip”, a depression plateau of less than 1 dB centered around 1kHz that is said to impart a more liquid and tube-like presentation. The X350.5’s neutrality and lack of any heavy-handed voicing shone through in the form of its musical presentation. Vocals and acoustic guitars were presented beautifully, and placed at the horizontal plane of the electrostatic panels or slightly forward of them. By contrast, my “voiced” amplifier presents the performance at the horizontal plane of the electrostatic panels and slightly behind which, to my ears, makes it appear slightly veiled at times when directly compared to the Pass Labs X350.5. I point this out as a matter of reference. The X350.5 is astonishingly linear and really showcases the transparency, accuracy, and lifelike qualities of the full-range electrostatics to its full effect without ever sounding forward or gimmicky. OK. So the amp can clearly sing with the best of them, but can it handle the rigors of long hard-driving, dynamic music, and remain composed doing so, even when driving the sub-2 ohm load of the electrostatics? This is literally what separates the men from the boys when it comes to large, high powered amplifiers. I must admit that this part of the evaluation proved to be the most fun. Back in my South Florida Audio Society days, we used to do power amp shoot-outs with some frequency, and at the end of the day, the true test of fortitude always meant hauling the amplifiers to my sound room and having them power my electrostatics. The inevitable conclusion 90+% of the time was that the test subjects either misbehaved, overheated and shut down, or otherwise suffered from collapsed soundstages and high frequency stridency that bordered on shrieking. The good news is that the Pass Labs X350.5 just doesn’t follow the playbook of most other large, brutish solid-state amplifiers. For instance, when playing excerpts from the LP Music and Rhythm, a benefit LP for WOMAD, World Music; Arts and Dance, Stewart Copeland’s explosive percussion work on Peter Gabriel’s “Across the River” is a challenge to just about any system. The X350.5 kept an iron fisted grip of the high energy percussion at all times and produced one of the most life-like and credible performances I have heard through my system, or any system, with respect to this particular song. Similarly, from the same album, XTC’s “It’s Nearly Africa” is in some ways, even more of a challenge, but did not ruffle the Pass X350.5 at all. The textures, nuances, and PRaT, not only remained intact, but I found myself actually hearing more of the low frequency information coming from the electrostatic bass panels than ever before. I confirmed this by switching off the subwoofers entirely and indeed, there was bass; tuneful, fast, clean, bass. Not something you usually hear from a CLS IIz panel in any great abundance, especially when the panel is suspended in mid-air and has no benefit from wall or floor reinforcement. Encouraged by what I was hearing, I went through a process of re-tuning the subwoofers to the CLS IIz’s and decided to follow-up with a Sheffield Direct to Disc recording, James Newton Howard & friends. I mean the real direct-to-disc recording and not a compressed 2nd or 3rd generation pressing from a master tape that was released afterward or excerpted in the Sheffield Track record. The cut, “Borealis” in particular was handled remarkably by the Pass Labs X350.5. The explosive dynamics of this recording remained intact through the audio chain and was amplified without so much as a hint of strain. In fact, the X350.5 shrugged off anything I would throw at it and I constantly had to remain mindful, that the CLS IIz’s also had their limits of power handling! Of course, this type of muscular flexing does come at a price. My listening sessions had to include intermissions every hour or so because of the tremendous heat that was generated from the X350.5. To be sure, this is no ordinary amplifier. The X350.5 is extremely quiet, with no perceivable noise floor, has the dynamic agility that in my opinion, is literally in a class by itself. 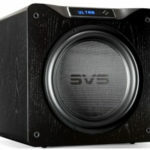 Its bass response is first rate in authority, weight, speed, and tunefulness. Yet, through this high-octane athleticism, emerges the soul of a small triode amplifier. The midrange remains beautifully rendered, subtle nuances and textures remain intact, and images are expansive and remain so, even when the amplifier is pushed hard. Again, not a me-too variety solid-state amplifier, far from it. In summary, a power amplifier’s job is to take the delicate low-level signal being delivered from the source via a preamplifier (usually) and amplifying it without imparting its own character or coloration in the process. This is exactly what the X350.5 accomplishes. If your needs include big power, really big power, as mine do, I wholehearted suggest a visit to your local Pass Labs dealership for an audition. Kudos to Nelson Pass, Desmond Harrington, and the rest of the Pass Labs team. This amplifier indeed receives an emphatic recommendation from me.